In response to the growing demand for programmatic video solutions, Fyber has doubled down over the past few months on the growth of our exchange, offering clients even more access to the world’s leading demand. We are pleased to announce today that between May and August 2015, the Fyber Exchange saw a weekly revenue increase of more than 250% for its mobile video products. Simultaneously, mobile video impressions on the Fyber Exchange increased by over 330% during the same timeframe. 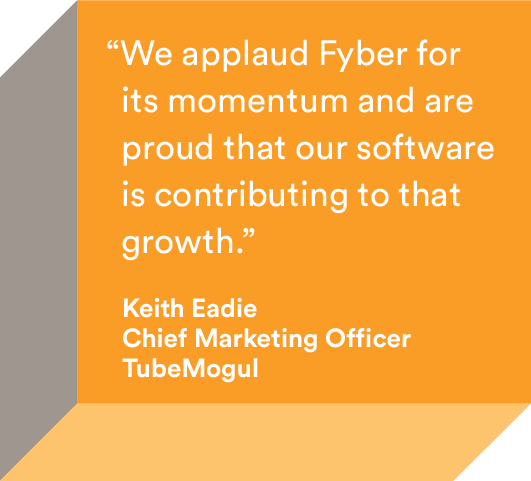 Mobile video in general has seen strong growth on the Fyber platform in recent months, underscoring a strong monetization and growth opportunity in mobile and multi-screen video as our most prominent ad format. The exponential growth in the number of mobile devices globally is driving mobile video ad spend at a faster rate than any other type of digital marketing. According to eMarketer, advertisers will spend $3.94 billion on mobile video next year, an increase of 50 percent. This growth is further supported by increases in programmatic ad spend, which is projected to reach $2 billion for video on all devices, and double again in 2016. “To capitalize on mobile video as the fastest growing ad format, we need to make the campaign buying process as easy and transparent for advertisers as possible,” said Janis Zech, Fyber’s co-founder. “This means a continuous investment in Fyber’s programmatic capabilities to strengthen the value provided by our own Exchange, on top of our vast mediated demand offerings.” Earlier this year, Fyber acquired RTB platform Falk Realtime to strengthen its programmatic stack by offering premium programmatic pre-roll and in-app inventory. The results of this strategy are underlined by the impressive roster of demand-side platforms working with our Exchange. Over 120 of the world’s leading DSPs and demand source partners – including AppNexus, DataXu, MediaMath, The Trade Desk, TubeMogul and YuMe – can now bid on Fyber’s global inventory. The gains reported today follow a number of market-leading enhancements to our mobile video products. These include an improved video player UX and advanced pre-caching controls that allow app developers to choose when and how many video ad network SDKs they want to initialize at app-start, resulting in a reduction in data and memory usage, loading times, and an overall improvement in app performance. We also extended our mobile video product offering to Android devices to better cater to cross-platform advertisers. Want to learn more about Fyber? Our team will be attending dmexco in Cologne, Germany from Sept. 16-17th. We’ll be sharing our latest product innovations and available to answer all your questions! Find us at Hall 6.1, booth B071!